If your home has ever been without power for an extended period of time, or even just for a couple of hours, you know exactly how many appliances and systems require electricity. During times of extreme heat or cold, being without power may become more than just annoying. A backup home generator powers your home (or at least parts of your home) in case of a power outage, so you don’t have to worry about food going bad in the fridge or your home staying cool in the middle of summer. We’ve got our top picks for most reliable generators below, as well as some basic information about what to look for in a backup generator. There are two main types of backup home generators: stationary and portable. Stationary or standby generators are permanent fixtures that must be installed professionally. They are always on standby, which means that when your home loses power, these generators automatically turn on, even if you’re not there. Portable generators are smaller and generally have wheels so they can be easily moved and stored when not in use. They must be started manually with either a pull-start engine or an electric start button. Already know which type of generator you are looking for? Jump ahead to see our recommendations. Stationary generators use transfer switches in the electric box to cause minimal power interruption when switching from standby to power. They also run diagnostics automatically to let you know when maintenance is needed, so they require less hands-on attention than portable generators. Stationary generators run on either natural gas or propane and typically produce between 5,000 and 20,000 watts. They are also pricey—these generators cost between $5,000 and $10,000 before installation and labor fees, so keep that in mind when selecting one. Because these generators are permanent additions to your home, you’ll need to check property tax, building permit, and code requirements before installation. One thing to note about stationary generators is that variations in power levels create what are called harmonic distortions. While these distortions may not affect larger appliances or systems, they can negatively affect sensitive electronics like laptops, routers, computers, or TVs. For that reason, it’s important to look for a generator with low levels of harmonic distortion or to plan on not using sensitive electronics during a power outage. The Generac 7033, while not as powerful as the other picks on this list, is a reliable option for a standby generator. It starts up quickly and automatically when it detects a power outage in your home, using a 200-amp transfer switch to do so. It also uses digital power management (DPM) technology to protect against overloading. Its harmonic distortion of less than 5% makes it safer to use with sensitive electronics. The Generac’s “G-Force” engine uses pressure lubrication to provide a more controlled flow of oil and generally requires less maintenance than other generator engines. Generac offers 24-hour customer service, and for an additional cost, you can monitor your generator remotely from your smartphone, tablet, or computer. (Please note that the monitoring service requires a monthly or yearly fee, starting at $99 per year after the first year.) Overall, the Generac 7033 stationary generator uses high-quality technology and materials to provide a reliable source of power during an outage. Though the 11,000-watt capacity cannot power as much as the other picks on our list, this generator is a more affordable and still excellent option, especially for a smaller home. 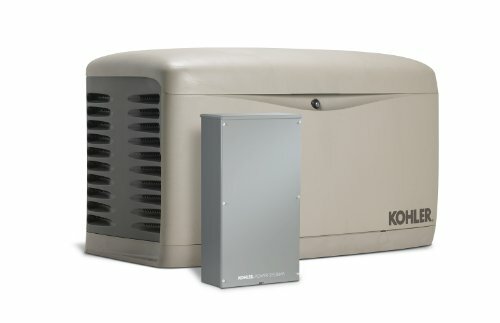 The Kohler 20RESCL standby generator is designed to keep your whole home, including central air conditioners, running during a power outage, with a response time of 10 seconds. It has low levels of harmonic distortion (less than 5%) to protect your sensitive electronics. Users report that it’s fairly quiet (similar to the noise produced by an air conditioning unit), especially for such a large generator. It comes in an indoor and an outdoor version, so you’ll want to decide where to install it before purchasing. Both versions have a corrosion-proof casing that is meant to withstand extreme weather conditions. Kohler offers users the OnCue monitoring system ($249 on Amazon), which monitors the generator and sends updates via text or email. The Kohler 20RESCL stationary generator is pricier than our top pick, and that doesn’t include the cost of installation, so keep that in mind. However, at 20,000 watts, it can power your entire home easily, making it a great option for those with larger homes. 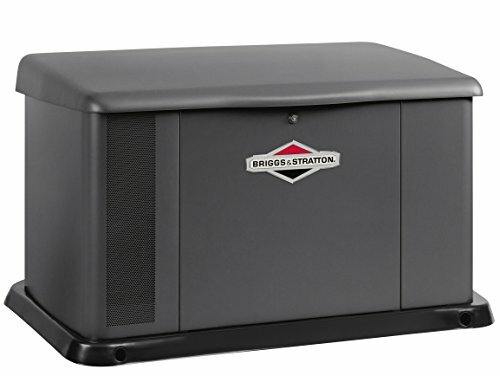 The Briggs & Stratton 40346 is a 20,000-watt standby generator with a 200-amp automatic transfer switch. It can power an entire house of up to 12,000 square feet and uses load shedding to automatically avoid overloading the system. The transfer switch has some flexible installation options and allows you to prioritize eight higher-need appliances (like an air conditioning unit, dryer, refrigerator, etc.) so that the generator will automatically turn those appliances on or off according to the power output. It kicks on very quickly after a power outage is detected—within a few seconds—and has a long-lasting and weather-resistant steel case. Some users reported that the Briggs & Stratton is a little louder than comparable products, but not so loud that it’s not useable. It is also quite expensive when you add in all the labor and installation costs. However, it’s still an excellent option for powering your home during a power outage. These generators cost less than standby generators—usually between $400 and $1,000—but they also provide less power than a standby generator (3,000 to 8,500 watts on average). While 5,500 watts is sufficient to keep the essentials running (for example, the refrigerator or freezer, a portable heater or window air conditioning unit, a sump pump, and some lights), you may need more or less power depending on the size of your home. 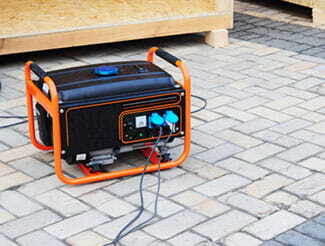 Portable generators need to be manually maintained and tested, and they run on either gasoline or propane. Propane is preferable because it can be stored for a long time, but a propane tank has to be hooked up to the generator, which can make it difficult to move. Gasoline is easier to put in a portable generator, but it cannot be stored long term without a stabilizer added—it is not advisable to put old or stale gasoline in your machine. While gasoline is readily available during non-emergency times, it can become very difficult and costly to find gasoline during an emergency, so having propane on hand is better. One thing to know about portable generators is they have two wattage ratings: running watts and starting or surge watts. When you start an appliance through a generator, it requires an initial surge of electricity to get it up and running, so take that into account when you are calculating how much power you’ll need for your home. Also, remember that even though you won’t need to pay for installation, some portable generators have additional costs for add-on features like batteries. Further, if you intend to attach your portable generator to your electric panel, you’ll have to consider installation costs for a manual transfer switch. 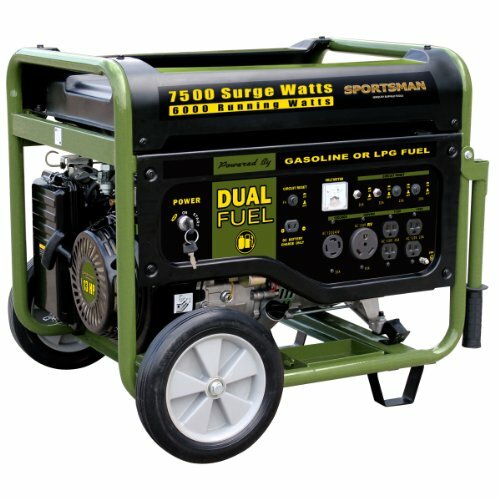 The Sportsman Series GEN7500DF is a dual-fuel portable generator, which means it can run on either propane (tank must be purchased separately) or gasoline with a 6.2-gallon tank. It has a decent running time of nine hours at a 50% load, so it can last through the night on one tank. It has a total of seven outlets—four regular outlets, one RV outlet, one outlet for battery charging, and one twist-lock outlet for transfer switch attachment—making it more versatile than many other generators. The Sportsman has both a manual and an electric start option. The battery for the electric start is not included, but a wheel kit and a five-foot-long propane fuel hose are. It is rated to run at 6,000 watts and to start at 7,500 watts. One of the things we liked most about the Sportsman is that, in addition to standard safety features like a low-oil engine shutoff, it also has a feature that detects when the electric current has found an alternate path or been interrupted, and it shuts off the engine before it can electrocute you. In fact, the only real drawbacks to this portable generator are the limited one-year warranty and the fact that it is louder than many other products, including some on this list, at about 80 decibels (which is comparable to a garbage disposal or blender). 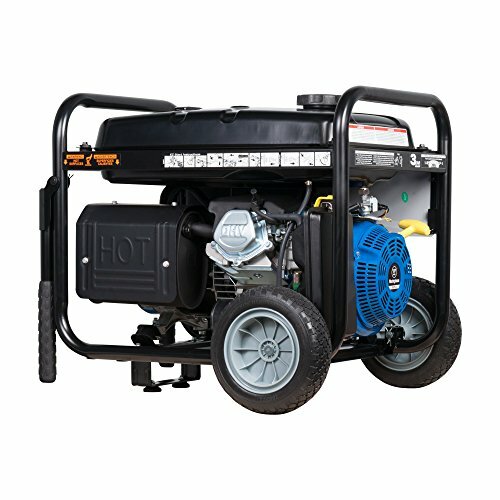 Other than that, the Sportsman Series GEN7500DF is an excellent, versatile option for a backup generator. The Westinghouse WH5500 is a powerful yet fuel-efficient portable generator. It features 5,500 running watts and 6,750 starting watts. It uses only gasoline, unfortunately, which can’t be stored long term so you will likely be reliant on gas stations during an outage. However, it has a 6.6-gallon tank and can run for about 14 hours on a 25% capacity load, which is incredibly useful during an emergency when gasoline may be difficult to get. It has four standard outlets and one twist-lock outlet so you can attach it to a transfer switch, and it comes with an hour meter that monitors how long it’s been running so you don’t have to. It also comes with a three-year warranty, which is the longest we’ve seen for a portable generator and definitely adds to the overall value. The Westinghouse WH5500 has a low-oil engine shutoff safety feature, but it does not have circuit-interruption protection to shut off the engine if the circuit is interrupted, like our top pick does. It also does not have an electric start option. However, it is quiet for a portable generator and it comes with everything you need to get started, including a wheel kit and an oil funnel. The extended run time alone is reason to consider the Westinghouse WH5500. 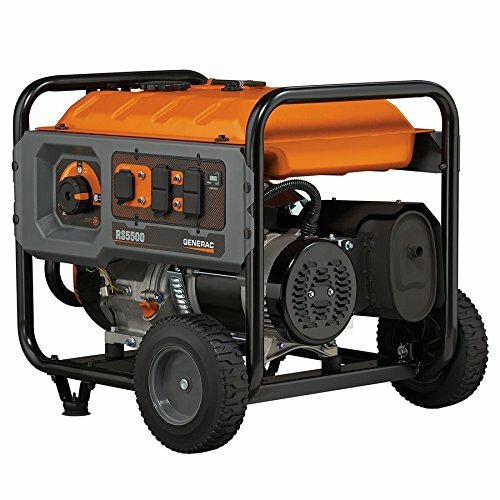 The Generac 6672 RS5500 is a gasoline-powered portable generator with 5,500 running watts and 6,875 starting watts. It has a 6.7-gallon fuel tank, which gives you around 11 hours of running time at a 50% load. That fuel efficiency will be helpful if gas is scarce during an emergency. It has four outlets plus a twist lock outlet that can connect to a transfer switch, and all the outlets are covered. Its hour meter keeps track of how many hours it’s been running. 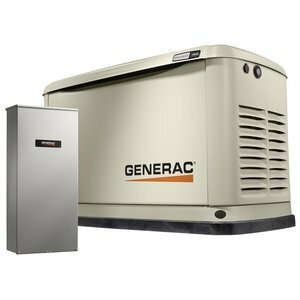 The Generac has only a manual start, but it comes with a dial that conveniently streamlines the startup and shutdown processes. It also has a low-oil shutoff feature for safety, but it doesn’t have the additional safety feature of our top pick. It also doesn’t have a stated noise level, which indicates that it is quite loud—some users complained about that aspect. 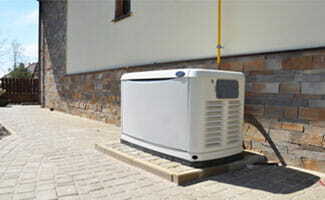 In spite of these drawbacks, it is a reliable option for a backup home generator. Though some generators have enough power to light up your entire house, keep in mind that backup generators are intended to provide for only your basic needs during an emergency. When choosing a generator for your house, take into account what you intend to power while the electricity is out and calculate the wattage of those appliances or systems to figure out what you would need in an emergency. Always check your local ordinances and zoning laws before adding a generator to your home, and remember to never use a generator indoors, as they produce toxic fumes, including carbon monoxide. While a backup generator can be a significant financial investment, you and your family will consider it money well spent every time you’re able to heat food, do laundry, turn on lights at night, and keep cool or warm during a power outage.